Swiss Cheese is definitely famous for being the cheese with “holes”. It is a buttery, smooth cheese with a firm texture and mellow flavors. Swiss Cheese is great with portabella mushrooms, white wines and fruits. Swiss cheese is a classic and a favorite for the whole family. 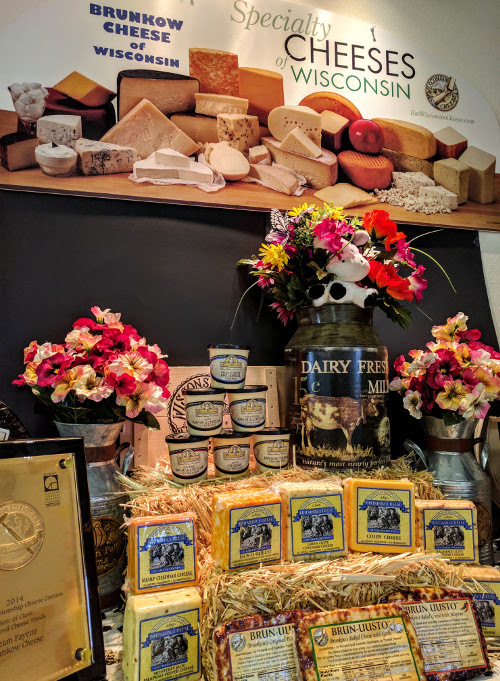 Our Baby Swiss has a more buttery, milky, and salty flavor than regular Swiss and its texture is softer, similar to a mild provolone or a muenster cheese. The size of our Baby Swiss cheese’s “eyes” are a lot smaller than the traditional Swiss, they’re about the size of peas. Our baby Swiss melts nicely and tastes mild and creamy, which makes for a nice variation on a grilled cheese sandwich. Another favorite is to melt our Baby Swiss over your burger and top it off with sauteed mushrooms. Our Muenster Cheese is a smooth, soft texture cheese with a savory and nutty flavor. This cheese is mild when young and can develop a strong, pungent aroma as it ages. Muenster has excellent melting properties and is perfect in mac and cheese and on burgers or pizza. Your kids will love Muenster melted over their vegetables. It is also great served as an appetizer; pair it along with Pilsner, Amber Ale, Saison or Stout beers. Muenster Cheese also pairs well with red wines such as: Pinot Noir, Zinfandel, and Bordeaux. 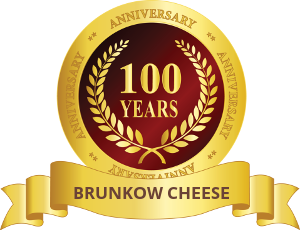 Brunkow’s Low Fat Farmers cheese is made from our Old world recipe. It is naturally low in fat, low in lactose, carbs and is low in calories. Our Low Fat Farmers is a great alternative to still be able to have dairy while on a restrictive diet. This cheese has a mild taste and is a cultured soft cheese. You will enjoy our handcrafted gourmet, Italian dry salami made from premium cuts of pork. Our Salami is packed with flavor in every bite. Serve our delicious Italian dry salami on top of a savory cracker and alongside one of Brunkow’s gourmet cheeses. Colby, one of Wisconsin’s original and was created in its namesake (Colby, Wi.). It is a beautiful golden color and has a mild to mellow (less tangy) flavor that is similar to a young cheddar. Colby Cheese has a softer, semi-firm texture which makes it ideal for grilling and grating over salads. It pairs well with apples, pears, tomatoes and red wine. Colby is a wonderful all purpose cheese.